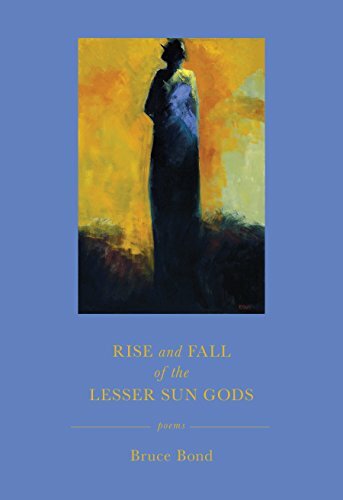 RISE AND FALL OF THE LESSER SUN GODS by Bruce Bond is one of the winners of the 17th Annual Elixir Press Poetry Awards. Laura Kasischke had this to say about it: "Bruce Bond has written a book length poem of spectacular beauty -- incantatory, shocking, full of wild imagery and eerie juxtapositions. This is a book to be read in a sitting, cover to cover, at first, in order to experience the full power of its accumulating force. But it's also a book the reader will return to over and over, one that continues to offer surprises and deeper insights, more rewards and greater epiphanies. Bruce Bond is a poet of extraordinary talent, a poet whose lifetime of devotion to his art has brought us this stunning and entirely new vision. However, in RISE AND FALL OF THE LESSER SUN GODS, we see not only all that such a poet is able to accomplish, but all that poetry itself accomplishes."